I love the movie The Da Vinci Code, based on the Dan Brown novel by the same name. If you haven’t seen the movie, the premise is about Dr. Robert Langdon, professor of symbolism (Tom Hanks), who was roped in to help crack a case, a mystery, a death of an old man who was murdered in The Louvre. His granddaughter, Sophie Neveu, reached out to Dr. Langdon for help. While they were trying to solve the mystery, Dr. Langdon asked Sophie if she recalled her grandfather teaching her anything about solving riddles and being able to keep secrets. She thought back long and hard and she recalled how he would create riddles for her to unravel. She was raised by him and was around that type of mindset all the time. This particular part of the movie came to mind as I have been researching my paternal side of the family, getting ready for my trip to Scandinavia. My paternal side is Swedish and Norwegian. My grandfather’s parents were both Swedish (his father being from Sweden) and my grandmother’s parents were dominantly Norwegian while there was a Swedish grandmother thrown into the mix. 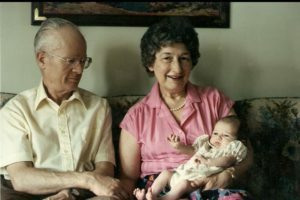 I was fortunate enough to spend a lot of time with my paternal grandparents growing up. We lived in the same town and got the chance to be over there a lot while my parents were at work or if we just wanted a Grandma Day. My grandparents and me, 1987. It’s been 26 years since my grandfather had me saying those phrases on a weekly basis, but recently, they have been coming back to me in unexpected ways. 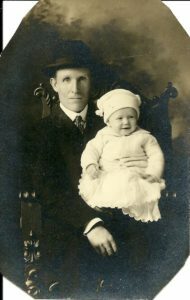 My great-grandfather Andrew and my grandfather Howard, approximately 1923. I have been digging deeper into my Swedish genealogy as an adult. For some reason, my family does not talk much about the Swedes and focuses more on the Norwegians. I am not 100% why that is the case, but that makes me want to dig even more! (We’re not scandalous or anything. We are too law-abiding for that). Reading my great-grandfather’s travel diary, it is labeled “Anders Pettersson, Storå, Sweden.” Storå . Like Storå til? My great-grandfather Anders/Andrew died in 1940, when my grandpa was 18 years old. His death was one of the leading factors for my grandpa to be closer to his mother, who died in 1982. My dad and uncle have said that they know little about their Grandfather Andrew. Maybe my grandpa was training me to know where his family came from? As I have been learning Norwegian to prepare for my trip, I have been using Byki through the public library system. It is an online program that teaches many languages to help prepare for travel. While studying, I came across a word: ingenting. Ingenting. Boy, that sounded familiar. It means “nothing.” Why would my grandfather teach me a Norwegian word? That didn’t make sense. But checking with the Swedish dictionary, the term also means “nothing” in Swedish. The language spoken in the home of Andrew Peterson in 1930 was Swedish. 1930 Federal Census, St. Paul, Ramsey, Minnesota. Andrew Peterson. Sheet 8. Accessed on Ancestry.com. In the Peterson home in the early 20th Century, the family spoke Swedish. Andrew came over to America from Sweden in 1884. His wife was first-generation American and she also heard Swedish in the home while growing up. Why is it that 50 years after being in Sweden was the language spoken in the home? Comparing notes with my husband, his grandfather grew up in a house where the children were not allowed to speak Czech, but they heard it when the adults gathered together. People will speak the language in their home that they feel the most comfortable with. Individuals need to know the language of the land that they apart of, but it is ultimately up to them what language they want to speak to one another in private or to better communicate an idea to each other. So I challenge you to figure out what sayings you remember as a kid. What was always said? Did it make sense? Look into those sayings to find out what they really mean for your family. You might be pleasantly surprised! ← Newest Member of the Daughters of the Union Veterans of the Civil War!